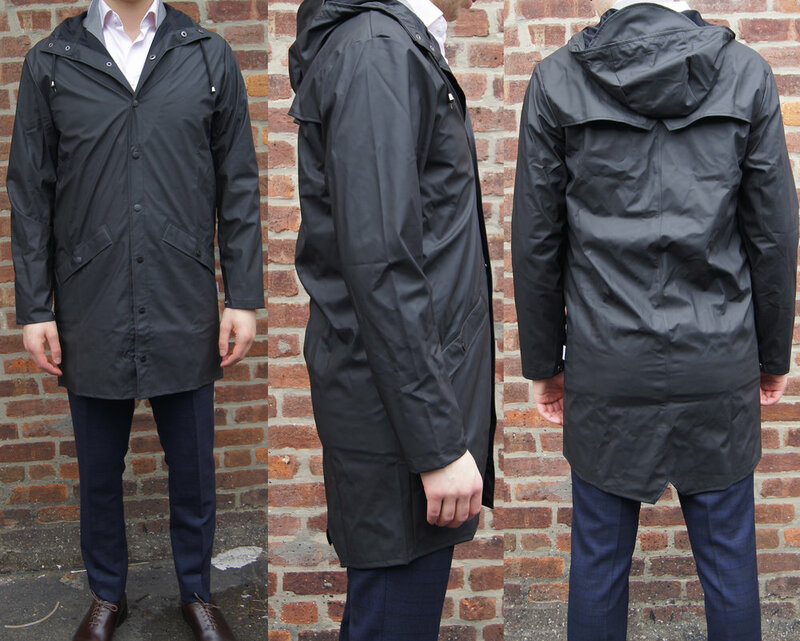 Given that the Spring/Summer months also usually mean a whole lot more rain, we’ve been looking at a bunch of raincoat options, and reviewing them and giving you our thoughts in usual TPL style. One company we couldn’t pass up is called RAINS, and, quite literally all they do is make outerwear products for the rain. Surely, a company that specializes in only making one product like this would do a good job, so we had to take a look and review it. We went with their Long Jacket ($125) for this review. We actually purchased it from Huckberry, though they are now sold out. Still, when we talk about the shopping experience, we’ll be talking about Huckberry. We went with the black long jacket for this review for two reasons. One, black is super versatile, and goes with everything. When it comes to throwing on a raincoat to brave the storms outside, you don’t want to worry about matching something to your outfit. 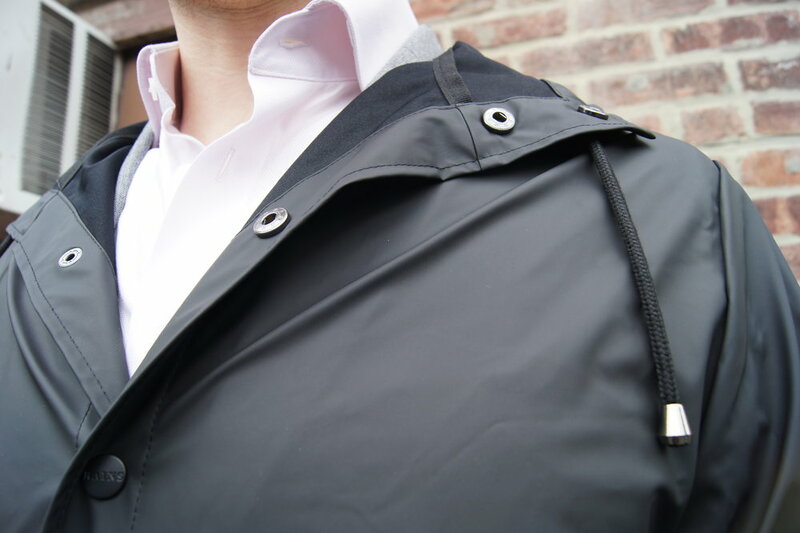 A raincoat should go with everything, so stick to grey or blacks, at least for your first raincoat. Two, we like that this is a longer coat, so it will keep more of you dry, and can also cover the tail of a suit jacket if you want to wear it more formally for when you are caught in the rain, but need to wear a suit. Again, if you are only going to have one raincoat, make it as versatile as possible. This coat from RAINS checks all those boxes. This coat definitely keeps you dry. It’s like wearing a lightweight tarp. And, indeed, this coat is quite lightweight. Great for the summer, less good for the colder months. On that note, it’s not very breathable and feels a bit suffocating at times. It doesn’t seem to have much ventilation either. Speaking of, these coats smell terrible out of the bag, and the smell didn’t seem to dissipate even after a few days of sitting around. I think with enough wear the smell would go away, but it’s extremely off-putting. It smells like some sort of chemical and artificial rubber concoction. It’s just not good. Trust us.